NASA's long-lived Opportunity Mars rover has been silent since June 11 in the wake of a global dust storm that swept around the red planet, blotting out the sun and preventing the rover's batteries from recharging. Despite clearing skies, the rover has yet to wake up, but it's no longer out of sight. 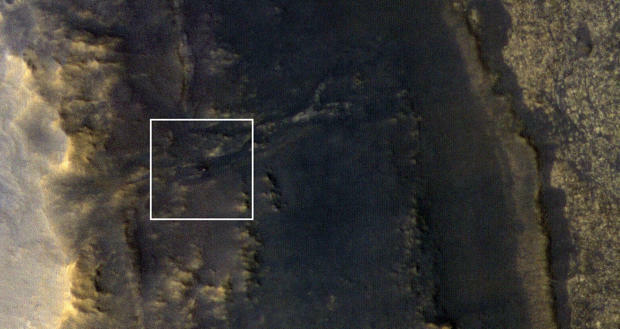 In an image released Tuesday, Opportunity shows up as a small dot-like feature in a high-resolution image captured by the Mars Reconnaissance Orbiter, showing the rover on the slopes of Perseverance Valley 166 miles below. Opportunity was slowly making its way down into the martian valley when the dust storm developed. Launched in 2003, Opportunity bounced to an airbag-assisted landing in January 2004, kicking off a mission designed to last just three months. But the hardy spacecraft was still on the job 14 years later when it slipped into electronic hibernation after losing power. NASA's Deep Space Network antennas are listening for any signals from Opportunity indicating an attempt to phone home and are now sending commands "in the blind" in hopes of helping the rover, if it is still able, to reset its internal clock and resume communications.